ATTRACTA (ATHRACHT), (Fifth Century), St. Attracta is believed to have been a contemporary of St. Patrick (17th March), from whom it is thought she received monastic tonsure. She went on to found monasteries in Co. Sligo and Co. Roscommon. St. Attracta was renowned for her charity and the hospitality she extended to travellers and the homeless. CHROMATIUS, (Third Century), the father of St. Tiburtius (vide infra) the martyr. Whilst Praefectus Urbi of Rome, St. Chromatius was converted to Christianity by St. Tranquillinus (6th July) and baptised by St. Polycarp (23rd February). DIGNA, (Fourth Century), an anchoress in the mountains near Todi in Umbria during the Diocletianic Persecution. EQUITIUS (EQUIZIO), greatly influenced St. Benedict of Nursia(11th July), he was the founder of a number of monasteries in the region of Valeria Suburbicaria (present-day L'Aquila-Rieti-Tivoli, Italy). St. Gregory the Dialogist (3rd September) speaks highly of him in his Dialogues. St. Equitius reposed at the monastery of San Lorenzo di Pizzoli circa 570. GAUGERICUS (GAU, GÉRY), a native of Trier, who became a priest, and was consecrated Bishop of Cambrai-Arras circa 585. He also assisted at the Council of Paris, October 614. St. Gaugericus reposed circa 625 after an episcopate of thirty-nine years. LELIA, (Date Unknown), there is no recorded information on the life of St. Lelia, though observances of her feast have been documented for hundreds of years. There are several places in Ireland whose names are derived from Lelia, including Killeely (Cill Liadaini), Co. Limerick. 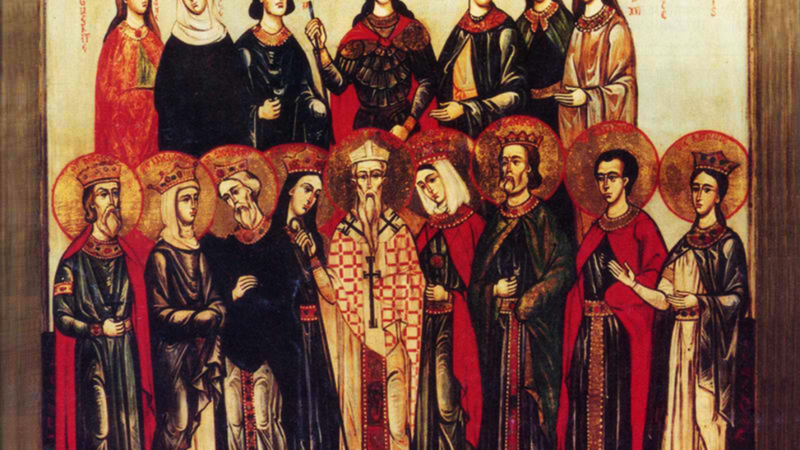 RUFINUS and COMPANIONS, (Date Unknown), there is a St. Rufinus, Bishop of the Marsi, and his companions, martyred under Emperor Maximinus listed in the Roman Martyrology on 11th August. However, he is in all likelihood the same as the St. Rufinus (of Assisi) listed on 30th July. SUSANNA, the daughter of St. Gainus (19th February) and niece of Caius, variously identified as either Pope St. Caius (22 April) or Caius, Presbyter of Rome. St. Susanna was beheaded by order of Diocletian, also a relative, in St. Gainus’ house circa 295. The house in which she was martyred, as well as the one next door, belonging to her uncle, were converted into a church which later became St. Susanna ad duas domos in Rome. For reasons no longer known she is frequently grouped with St. Tiburtius (vide infra) on calendars, though there is no connexion between them. TAURINUS, traditionally counted as the first Bishop of Evreux in Normandy. He reposed circa 410 – 412, there is no further information extant. TIBURTIUS, the only son of St. Chromatius (vide supra). During the Diocletianic Persecution, St. Tiburtius was martyred by beheading at the third mile-stone of the Via Lavicana 286. He is mentioned in the legends of St. Sebastian (20th January) who is said to have been his Godfather. St. Tiburtius was entombed in the Inter duas lauros cemetery on the Via Lavicana. For reasons no longer known he is frequently grouped with St. Susanna (vide supra) on calendars, though there is no connexion between them.